An infirm, lifetime alcoholic suddenly becomes sober and strong. A patient undergoing open-heart surgery amazes the doctors with a speedy convalescence. A cancer patient given only a few months to live defies the predictions. What accounts for such remarkable recoveries? Is it miracle or medicine? In this extraordinary book, Dr. Harold G. Koenig presents groundbreaking scientific evidence that provides answers to these puzzling medical mysteries. You will read about the pioneering study that found nonreligious patients with heart disease to be three times more likely to die following surgery than their religious counterparts. You'll learn why saying prayers regularly can be as effective as taking medicine, and why prayer and medicine together are such a potent combination. Here you will meet the unforgettable patients who taught the doctors so much as they triumph over life-threatening disease, heartbreaking marital problems, dangerous addiction, and more. 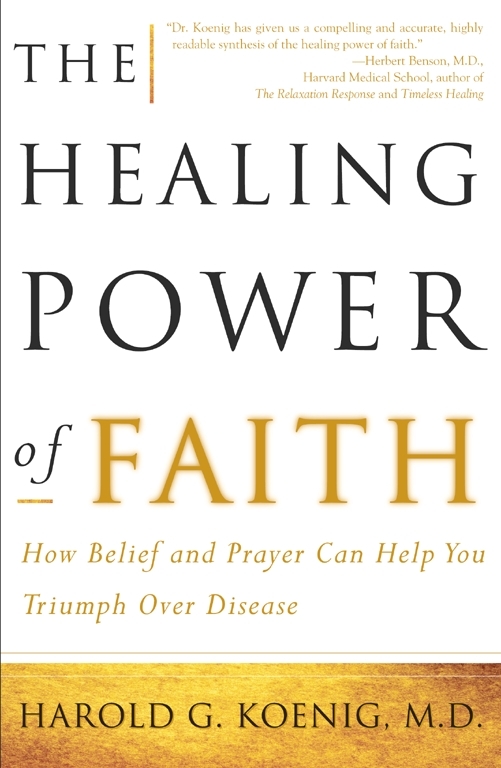 With simple, practical methods for harnessing the power of faith, this potentially lifesaving book provides an astonishing and immensely effective strategy for healing. In February 1996, I chaired a symposium on "Social and Religious Factors Affecting Health" at the annual meeting of the American Association for the Advancement of Science. A professor from a prestigious university approached me during a coffee break at the Baltimore conference room. "Doctor Koenig, how did someone with your background ever become interested in religion?" he asked. "That's a tough question," I replied. After all, I'm a physician who has spent years mastering several complex specialties. The Association is widely viewed as the world's most prominent science organization. And natural science, with its immutable laws and formulae, is the foundation of modern medicine, while religion, by definition, deals with inexplicable supernatural powers and events. He no doubt wondered what had made me diverge from my grounding in biomedical science to venture into the intangible realm of religious faith. My career has been more a voyage of discovery than a predictable linear progression from student to clinician to medical professor and researcher. During this twenty-year odyssey, I've worked as a hospital orderly and registered nurse, often in intimate contact with sick people. I have been certified in family medicine, psychiatry, geriatric medicine, and geriatric psychiatry. My clinical practice has brought me newborn babies and their mothers as well as elderly people in their final weeks, and the full range of physical and emotional illness between infancy and old age. I've encountered people whose bodies were ravaged by disease, but who somehow remained optimistic and emotionally healthy, and others who were so wounded by stress and emotional trauma that the ensuing depression destroyed their lives. Today I am director of Duke University's Center for the Study of Religion/Spirituality and Health, the world's first major research facility to comprehensively study the impact of people's religious life on their physical and emotional health. Struggling to answer my colleague's question that February afternoon in Baltimore, I recognized an important aspect of my professional life: It was my patients who led me to explore the previously underinvestigated connection between health and religious faith. Without question, I have learned more about the resilience of the human spirit in the face of crushing adversity from the people I treated than I ever did from textbooks or medical school lectures. I met the first of these patients -- a middle-aged man named Lee Daugherty -- in November 1981, when I was a third-year medical student at the University of California at San Francisco. As part of my Internal Medicine rotation, I covered rounds at San Francisco General Hospital. Lee had been admitted on Halloween, suffering from severe complications of alcoholism. "Good morning, Mr. Daugherty," I said to the gaunt man hunched beneath the sheets. His hair was long, his face haggard. Lee's chart reported he had been living on the streets of the Mission district for years. His daily alcohol consumption was estimated at more than six pints of cheap fortified wine. The night before, he had suffered a seizure, tumbled headlong into the street, and sprawled there in the cold drizzle, unable to rise. Lee's diagnosis included cirrhosis, neurological involvement, and complications of malnutrition. His blackouts and seizures were the most alarming symptoms, a probable indication of brain damage. Lee rolled over and stared at me with red-rimmed eyes. "What time is it?" he grumbled. "Just after seven." Rounds on this ward started early. "Can I have some coffee?" he asked as I felt his rapid, uneven pulse. Before rounds that morning, my instructors had described Lee as a typical "terminal" alcoholic. My initial examination seemed to confirm that grim prognosis. But, unlike some of my fellow students, and because I'd worked wards as an orderly and nurse, I saw my patients as real people, not just interesting cases. With Lee, I was gripped by the need to help someone who was suffering, but also by a sense of futility. I knew that Lee's level of alcoholism could rarely be cured. People like Lee are not "problem drinkers," but so profoundly addicted that they suffer life-threatening convulsions if deprived of alcohol. Almost inevitably, the disease crushes their spirits until they're sluggishly fatalistic. But I saw a lively spark in Lee's blue eyes. I fetched him a cup of coffee. Lee sat up in bed and examined me with new interest. "Doctors never did that before," he said, cuddling his coffee cup. "You've had a terrible time, Lee," I said, consulting his chart, "and you're very sick. I'm recommending we keep you here as long as possible. You just can't go straight back to the street." "I'll be okay once my legs get better, Doc," he said. Even though I was as overworked as any medical student, I stayed with him a while longer. "You will not be okay, Lee," I said, placing my hand on his thin arm. "If you start drinking again, you'll be dead before summer." Lee savored the last of his coffee. "I'll be all right," he insisted. "God has a purpose in my life." His confident words surprised me. Lee Daugherty was one of the "lost souls" who can be found on inner-city streets across the country. Yet he seemed to firmly believe that God would intervene in his life. "How can you be so sure?" I was preoccupied with hard medical science, not the mysteries of faith. "God has a plan for me," Lee repeated. "Last night, layin' there in the gutter, I saw kids in Halloween costumes going up Mission, and I thought about my life..."
Lee had been born in rural Oklahoma in 1931, at the peak of the Dust Bowl drought that sent thousands of Okie immigrants to California. His father had died when Lee was an infant, and his mother soon fell ill. He and his brother were raised in foster homes. By his twenties, Lee was one of the country's millions of functional alcoholics, working as a cook, successfully hiding his growing addiction. Alcohol, however, eventually overpowered his life, and by his forties Lee was living on the desolate streets of San Francisco's Mission district, panhandling for rotgut wine. He didn't drink for pleasure anymore, but just to "keep from getting sick." Lying against the cold curb, his legs paralyzed, Lee had prayed for guidance. "Lord, if this is all there is to life," he had moaned, speaking directly to God, "I just want it to end. But if there is more, can you show me?" He had virtually hit rock bottom the night before in that gutter. Yet now he seemed serene. "I think the Lord is showing me the way out of this mess," he said confidently. "Maybe so," I agreed to keep his mood up. "But you're still going to need a place to stay when they discharge you. And you're going to have to go through detox again." Lee nodded. "This time I'm going to make it, Doc." You can appreciate my skepticism. Lee Daugherty had already been through half a dozen detoxification programs. He'd also tried Alcoholics Anonymous. He'd always gone back to drinking. Yet somehow he was convinced that the Lord would lift the burden of his disease. I suddenly recalled a passage from Sigmund Freud that had impressed me as a premed student. Religion, Freud had proclaimed, was the "universal obsessional neurosis of humanity." This undoubtedly hopeless alcoholic seemed gripped by just the type of delusion Freud had identified. Well, I thought, at least Lee's faith brings him some comfort. I managed to keep him in the hospital for almost a week so that his withdrawal symptoms could be tempered by medication. And I helped find him a hotel room near the detox center. I also gave Lee my phone number and asked him to stay in touch, secretly fearful that I'd receive a call from a cop who'd found the number on Lee's lifeless body on the street. Imagine my surprise when Lee called me that spring. "I'm getting married, Doc," he announced proudly. Lee had met Charlotte in the San Francisco General detox program. Like him, she had an abiding faith that God would free her of alcohol dependence. Together they were struggling through each day, determined to let their faith guide them to the inner healing necessary to break the grip of alcoholism. When I left California to begin my family medicine residency at the University of Missouri in Columbia, Lee and Charlotte Daugherty were sober and working, saving their money in hopes of buying a home. "We couldn't have done it without God's help," Lee said, noting that they began and ended each day reading scripture. "I really like Ecclesiastes," he added. " 'To every thing there is a season...a time to weep and a time to laugh...' This is our time to get well." Proud of my new M.D., with boundless confidence in the power of medical science, I attributed Lee's remission more to the techniques and medications of the detox counselors than to the healing power of his faith. But his experience had also sparked an ember of curiosity. Would he and Charlotte have managed to salvage their lives if they hadn't possessed such a deep faith? Ruby and Bill Clevenger were also patients who sharpened my interest in the health benefits of religious faith. During my family medicine residency in Missouri in the early 1980s, I often visited patients in their homes. The Clevengers lived in an old frame farmhouse in Callaway County. Bill Clevenger was eighty-one when we met. He had the strong, gnarled hands and weathered face of a man who'd worked hard his whole life, but he was now incapacitated by emphysema, and also suffered increasing deafness. Ruby, then near seventy, had a glow to her cheeks and a serenely cheerful manner. Despite Bill's health problems, they welcomed me to their home with the genuine graciousness that comes naturally to many country people. As we sat in the small parlor, I discreetly studied them both for any signs of melancholy that might indicate an underlying depression. Doctors learn early in their careers that serious, sometimes crippling depression afflicts many elderly people suffering from chronic physical illness. Although about 5 percent of the general population suffers from depression, almost half of those people with severe health problems become depressed. Many sick older people abandon hope that their lives will ever get better. Nervous and irritable, they lose interest in activities they once enjoyed, often have difficulty concentrating, withdraw from others, and feel worthless. Indeed, the severe depression that frequently follows physical illness can delay healing and provoke premature death. With his emphysema growing worse and threatening to make him housebound, and his deafness deepening his isolation, Bill Clevenger was a likely candidate for depression. But the handsome elderly man sitting across the parlor on the chintz-covered easy chair was obviously alert, beaming with friendly interest in my visit. "Finally getting some nice spring weather," I commented. Bill cupped his ear and leaned toward Ruby. "Ask him to please speak so that I can hear him," he said in a loud, toneless voice. "Sorry," I said, speaking louder. I was prepared for Bill to slip into a sour lament about his failing health. But he grinned warmly. "I like to talk if I can hear what people say." He explained that his hearing had deteriorated over many years, beginning when he was a youngster working with explosives on the railroad. "But I can still sing my hymns at church," Bill added. "We're Baptists," Ruby interjected, "but we've gone to all kinds of different churches over the years." There were religious pictures on the walls and end tables. They were standard, inexpensive pastel-tone prints -- The Last Supper, Jesus alone in prayer, the Virgin and Baby Jesus. "I get them at rummage sales," Ruby said. "They always make me feel good." The Clevengers seemed to take comfort in religion and church worship. But I had no way to gauge the impact of this faith on their physical health and outlook. However, it was clear that neither one suffered from depression. Bill's laugh was hardy and unfeigned; Ruby's plans for their summer vegetable garden rang with cheerful optimism. But it was when they brought out their photo album that I discovered just how well Bill and Ruby had coped with an often difficult life. "We've been foster parents for years," Ruby said, opening the album to reveal snapshots of the Clevengers and a remarkable number of children on picnics or grouped around a Christmas tree. Some of the children had crutches; several were of mixed race. "We took the kids other people didn't want," Bill said. "They're all precious in the eyes of the Lord," Ruby added, fondly turning the pages to linger on the dozens of young faces that had passed through their lives. She showed me the six teenage girls they had cared for at the same time several years earlier. Some of them had been abused. All had come from shattered families. Bill Clevenger beamed, studying the girls' pictures. "We didn't always have a lot to give them except a warm house, clean clothes, and good hot food," he said. "And love," Ruby added. "They all got plenty of that." I was surprised that the Clevengers were still active foster parents, despite Bill's condition, which demanded a lot of care from Ruby. Leafing through the album, I realized that both Bill and Ruby Clevenger enjoyed a healthy self-respect, yet were completely free of the self-absorption that grips many elderly people with health problems. We were still looking at the pictures when the kitchen door opened and a slight, dark-haired girl of about ten entered, moving tentatively in the presence of a stranger. "Cindy," Ruby said, taking the child's hand. "Say your hello to Dr. Koenig." "Cindy's our daughter," Bill said proudly. Cindy was mentally retarded. Ruby gently explained that they had adopted the girl after she had spent her first three years in their home as a foster child and it became obvious her disability would make adoption elsewhere very difficult. "She's God's child," Ruby said with surprising conviction, taking Cindy onto her lap. How many old people with their problems would have happily assumed such a responsibility? Over the coming months, I often visited the Clevengers. Bill's physical condition did not improve. But both he and Ruby retained their uncomplaining cheerfulness. And they always made some reference to the role of religion in their lives. Somehow, I realized, their faith is shielding them from depression. As my residency continued, I became convinced that there were many people like the Daughertys and the Clevengers who used religious faith to cope with otherwise crushing problems. I'll never forget Mrs. Edna Hanson (name changed), whom I met in the university hospital the day before she had surgery. Mrs. Hanson, a widow of seventy-five, was a ten-year breast cancer survivor who had later received a hip replacement. As sometimes happens, the artificial hip joint did not graft well. Now she faced the same painful surgery again. That afternoon I found her sitting in a chair at the window of her hospital room, quietly reading the Bible. "I hope I'm not intruding," I said. She slid her bookmark into place and smiled. "You're not disturbing me at all," she said. "I was just reading Matthew and Luke." After we discussed her physical therapy schedule, I became curious about her religious faith. Unlike other patients I'd encountered confronting major surgery with a questionable prognosis, she showed no obvious anxiety. "How do you feel about tomorrow?" I asked. "It must be hard going through all this again." She thought a moment. "Well, I got real angry when they said I'd have to come back for a new operation," she said with some embarrassment. "Then I got real sad, just sort of blue for a week or so. I lost my appetite and I cried at night when I couldn't sleep." She reached for her Bible. "Then I began reading my scripture. I like to say the Lord's Prayer out loud, just the way Jesus taught it to the disciples. It's calmed me down completely." "You certainly look calm," I agreed. "The Bible just brings me comfort," she said. Indeed, her pulse rate and blood pressure were normal. Mrs. Hanson's case history stated that her husband of forty-six years had died three years earlier and her two grown children, who lived out of state, were unable to be with her. She was emotionally isolated as she faced the uncertainty of this new operation, yet coped with the stress amazingly well. As I left the room, she switched on the table lamp and took up her Bible. The image of that elderly woman sitting alone with her scriptures remained with me on my rounds. Pre-op patients often required medication to calm them, but not Mrs. Hanson. Was she a rare case, or did her faith bring her both emotional and physical peace? Were Lee and Charlotte Daugherty and the Clevengers also exceptional? Nothing I'd been taught in four years of medical school or the first two years of my residency even hinted that religious faith could break the grip of addiction, shield people from depression, or calm them at times of emotional trauma. In fact, there were many examples in the medical literature that echoed Freud by implying religion was a neurotic crutch of little practical use at times of severe stress. In a 1960 report entitled "The Meaning of Religion to Older People," geriatric expert Dr. Nila Kirkpatrick Covalt had found no evidence to support the accepted belief that "people turn to religion as they grow older." As to the benefits of scriptural reading for the hospitalized patient, Covalt was almost scornful: "We physicians have learned that when a patient brings a Bible with him to the hospital and keeps it displayed, this action is a sign of anticipated trouble from an insecure individual." Covalt described ignorant patients from "fringe" religious sects who brandished their Bibles and became so uncooperative that they upset hospital routine. But the religious patients I had encountered certainly did not fit this pattern. Faith seemed to have brought the Daughertys, the Clevengers, and Mrs. Hanson a degree of protection from physical and emotional illness. I began to wonder if modern medicine, in its quest to shine the light of scientific truth on the last vestiges of medicine-show quackery, was ignoring the potential healing power of religious faith? Although I became intrigued by this question, I recognized that my experience with religious patients had been limited to what we call "anecdotal" observation. But I also knew that every breakthrough in medicine had begun with such random observations that led to hypotheses, which eventually stood up to the stringent testing of the scientific method. Edward Jenner observed that dairymaids were immune to smallpox because they contracted the less virulent cowpox; this led to the discovery of "vaccination" (which derives from the Latin word for cow). Sir Alexander Fleming noticed that common bread mold, penicillium notatum, killed bacteria in a petri dish; that chance observation sparked the development of antibiotics, which have revolutionized medicine. But how could I test the hypothesis that religious faith had inherent healing power? Scientific research demands rigorous investigative methods and exacting, neutral peer review of findings and conclusions, which other researchers can then replicate. Launching such a disciplined research study into the health benefits of religious faith in the mid-1980s was scary. I was a young resident and sure didn't want to get branded as an "unscientific" religious zealot. So I began my research career with a small investigation. Geriatric and psychiatric studies had established that fear of death could cause chronic stress that diminished the quality of life of older people. Yet among my religious patients facing life-threatening illness, I'd noticed many whose faith shielded them from this morbid preoccupation. Therefore I decided to investigate the relationship between religious belief and practice and death anxiety among several hundred elderly people attending senior lunch programs. To test my hypothesis that religious faith and practices such as prayer, scriptural reading, and church attendance might help older people cope with several forms of stress, including death anxiety, I circulated a twenty-six-item questionnaire among the subjects. I was trying to assess their religious belief and activities, their feelings about death, their tolerance of stress and what social scientists call general "coping." To probe their reliance on faith under stress, I asked, "When you are facing a difficult situation, how likely are you to use prayer to help you deal with the situation?" They could respond with "unlikely," "somewhat likely," and "very likely." I also instructed them, "Think of the most stressful experience you had in recent months. To what extent did you use your religious beliefs in coping with this stressful experience?" The possible responses ranged from "very little" to "very much." In addition, I asked about their level of community activity and their involvement in their church congregation or faith community. I wanted to separate nonreligious activity such as club membership from purely religious practices such as participation in worship service. To measure their level of death anxiety, I asked: "There are many feelings people have about death. How do you feel?" People could respond on a scale ranging from "fearful and anxious" to "no fear or anxiety." I assessed the subjects' physical health, because research showed that people suffering serious illness are often fearful of death. Responses ranged from "sick and disabled" to "very healthy, not disabled." After posting all the responses and checking their validity with recognized statistical procedures, I was surprised and heartened by the findings. Those elderly people who were "very likely" to rely on religious faith and prayer when under stress were much more likely to report little or no fear about death, when compared with their peers for whom faith and prayer were less important. This difference was statistically significant: 10.3 percent of the deeply religious people experienced death anxiety compared with almost 25 percent of the less religious. People who were actively involved in their religious communities also reported less fear of death. But my findings suggested that it was personal faith and not necessarily religious activity that helped these older people deal with stressful problems and allowed them to cope with fears of death. Religious faith was especially important among the chronically ill and disabled older people. Looking back, that first research project was indeed modest. However, I was encouraged that my findings were both statistically significant and had passed the rigor of the peer review process. In the mid-1980s, the connection between health and spirituality, and research on other "mind-body" relationships, had not yet achieved widespread acceptance. Many of my colleagues tried to steer me away from what they saw as a marginal field of investigation. To them, the only demonstrable links between faith and health were the dubious practices of greedy television faith healers. I understood their concern. During my training in geriatric medicine, psychiatry, and geriatric psychiatry in the 1980s, I was flooded by discoveries on the frontiers of molecular biology and brain chemistry. Medicine could now chart the progress of cancers and cardiovascular disease from the cellular level and devise bold new treatments for these dread illnesses. CT scans and MRI technology opened exquisite windows into the living body. Whole new classes of psychoactive medications had burst on the scene, allowing us to treat previously intractable conditions such as schizophrenia and bipolar disorder. I was in the middle of a new renaissance in scientific medicine. But I continued to meet patients like the Daughertys and the Clevengers whose health had been clearly bolstered by their religious faith. Explaining this phenomenon in scientific terms has become my life's work. Since my first tentative faith-health research, I have led or participated in scores of much larger and more thorough studies. Eighteen years have passed since I met Lee Daugherty. As head of Duke University's Center for the Study of Religion/Spirituality and Health, I've seen research on religion and health evolve from pioneering studies by Duke faculty in the 1960s. Over the years, our center's scientists have led over fifty major research projects on the relationship between faith and health. More than seventy data-based, peer-reviewed papers published in medical and scientific journals have resulted from these projects. Duke's center divides the role of religion/spirituality in health into three categories: "Illness Prevention," "Illness Recovery," and "Treatment/Health Services Use." Other research facilities, including the Mind-Body Medical Institute of the Harvard Medical School and Boston's Deaconess Hospital, have investigated the physiological effects of spiritual practices such as meditation. But our center has focused on the impact of traditional religious faith and practice -- including individual prayer and congregational worship among American Christians and Jews -- on physical health and emotional well-being. These investigations have rigorously followed the established techniques of medical and social scientific research. My colleagues and I have avoided the delicate issue of the supernatural. For example, we don't try to establish the validity of faith healing, but we do investigate the therapeutic or healing power of people's religious faith. We certainly do not try to prove which religious or spiritual beliefs are more valid or correct in an absolute sense. Despite our differing individual faiths, we are scientists concerned with concrete data, not evangelists dealing with theological matters. People who regularly attend church, pray individually, and read the Bible have significantly lower diastolic blood pressure than the less religious. Those with the lowest blood pressure both attend church and pray or study the Bible often. People who attend church regularly are hospitalized much less often than people who never or rarely participate in religious services. People with strong religious faith are less likely to suffer depression from stressful life events, and if they do, they are more likely to recover from depression than those who are less religious. The deeper a person's religious faith, the less likely he or she is to be crippled by depression during and after hospitalization for physical illness. Religious people have healthier lifestyles. They tend to avoid alcohol and drug abuse, risky sexual behavior, and other unhealthy habits. Elderly people with a deep, personal ("intrinsic") religious faith have a stronger sense of well-being and life satisfaction than their less religious peers. This may be due in part to the stable marriages and strong families religious people tend to build. People with strong faith who suffer from physical illness have significantly better health outcomes than less religious people. People who attend religious services regularly have stronger immune systems than their less religious counterparts. We found that people who went to church regularly had significantly lower blood levels of interleukin-6 (IL-6), which rises with unrelieved chronic stress. High levels of IL-6 reflect a weakened immune system, which, in turn, increases the risk of infection, autoimmune disease, and certain cancers. Religious people live longer. A growing body of research shows that religious people are both physically healthier into later life and live longer than their nonreligious counterparts. Religious faith appears to protect the elderly from the two major afflictions of later life, cardiovascular disease and cancer. In this regard, religion may be as significant a protective factor as not smoking in terms of survival and longevity. Hundreds of major studies by other researchers have produced similar findings. For example, religious hip-fracture patients recover faster than their nonreligious counterparts. Older people who attend religious services avoid disability significantly longer than their nonattending peers. After open-heart surgery, patients who find comfort in their religious faith are three times more likely to survive than nonreligious patients. The risk of dying from all causes is up to 35 percent lower for people who attend religious services once or more a week than for those who attend less frequently. What does all this research mean to you and your family? Probably more than you realize: The chances are you are already religious; the great majority of Americans are. Polls indicate that 96 percent of people believe in God or a universal spirit and that 90 percent pray. Some social scientists and journalists are convinced religion is enjoying a rebirth in America as Baby Boomers age and confront their own mortality. For example, Deborah Howell, Washington bureau chief of Newhouse News Service, recently noted in a C-SPAN television discussion: "The news media are finally getting it. Religion is the most important aspect of most people's lives." Certainly the runaway popularity of television shows such as Touched by an Angel and Promised Land indicate that millions of Americans are interested in spiritual matters. But fewer than half of all Americans (43 percent) regularly attend religious services, even though research reveals that people who combine a strong personal faith with religious activity, including participation in worship service, receive the most significant health benefits of faith. The results of our research suggest it would be beneficial to increase your religious practices if this is compatible with your personal faith. Even if you lack strong faith, you might gain considerable health benefits by observing devoutly religious people and adopting some of their practices, perhaps community volunteer work. Later in the book, we will discuss the practical application of our research, even for those who lack religious belief entirely. You will not find any pastoral advice or specific spiritual guidance in this book. Instead, I hope the personal stories I have shaped from case histories and linked to relevant research findings will allow you to reach conclusions about the contribution that faith and religious practice can make to your own health, healing, and well-being. I want to emphasize that the concept of "Healing" used in the title of this book is not limited to the cure of physical disease or recovery from injury. When people suffer prolonged illness or disability, they often become slaves to the disease, which can dominate every aspect of their lives. I've met patients who surrender to illness and experience anguished desperation that far exceeds their physical pain. In some cases, we recognize this hopelessness as depression, which can further erode physical health and make recovery very difficult. But others, like Bill Clevenger and Mrs. Hanson, use faith to place their physical conditions in perspective and give them the confidence needed to fight the illness. We physicians do not fully understand the relationship between mind, body, and that intangible element known as spirit. But we treat religious people every day whose indomitable spirits and faith prevent their physical sickness from ruling their lives. The nature of "Faith" mentioned in the title is described by many of my patients as the confident belief in a supreme being, which most call God. For them, God is loving and accessible. This is a God who listens to prayer, who responds, who desires good for humanity. This is an intentional God who sets goals we can strive toward to reach our highest potential in terms of physical, mental, and spiritual health -- which aren't always achieved in that order. Those with faith in this God rarely feel lost or abandoned or experience the psychological anguish we call "anomie," a condition that afflicts millions in our fast-paced, affluent world. What is the connection between the concepts of "Faith" and "Power" in the title? People have told me that their faith gives them a tangible sense of mastery in their lives. When the inevitable stress of daily problems -- illness, financial worries, personal conflicts -- threatens to overwhelm religious people, they draw on a reserve of energy and motivation that allows them to persevere. They trust in God to fill the gap between what they could normally endure and what is actually required of them. They do not struggle alone, but rather see God as their active partner in the continuous struggle to achieve peace and balance in their lives. Is this confidence in "the Healing Power of Faith" rational from a purely scientific perspective? I recognize that research can neither prove nor disprove the reality of answered prayers or divine intercession. By definition, a supernatural event is beyond the reach of scientific investigation. And I also accept that my role as a physician and medical researcher is different from the clergy's. But, although scientists cannot demonstrate whether God exists and intervenes in people's lives, I have learned that we can certainly explore and chart in a scientific manner the effect of religious faith and practice on physical and emotional health. Malcolm McConnell is the coauthor of the #1 New York Times bestseller American Soldier with Tommy Franks and My Year in Iraq with L. Paul Bremer III. Herbert Benson, M.D. Harvard Medical School, author of The Relaxation Response and Timeless Healing Dr. Koenig has given us a compelling and accurate, highly readable synthesis of the healing power of faith. Larry Dossey, M.D. author of Prayer Is Good Medicine When the history of the return of spirituality to medicine is written, Dr. Koenig will occupy a high place. Dr. Harold Koenig...is one of a handful of modern scientists who have virtually invented a new field of medicine, and I applaud him.